Material: Latex Soft Ears. Our goal is to make sure that you can find exactly what you are looking for and make it easy for you to place your orders. Use these fantastic BIG Ears to complete your fancy dress look, perfect for Elf and Pixie outfits. 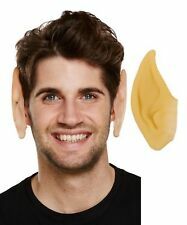 Big Ears Elf Halloween Fancy Dress Accessory. Ideal for an elf, alien, pixie or Hobbit! Simply fit over your own ears - Comfortable. A great value pair of fancy dress Santa elf pointed vinyl flesh coloured ears! Ideal for Christmas and would look amazing with a Santa elf hat! Flesh Pointed Ears. Includes: 1 Pair of Pointed Ears. One Size: Adult. Receive an order within 24 hours! ORDER BY 1PM. ~Just place over ear tip and the Vinyl ears Stay in place as if by magic!  ● Ideal for elf, fairy or pixie cosplay. 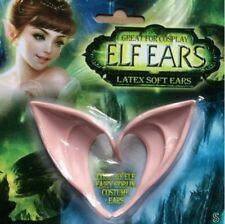 Latex Fancy Dress Elf Ears.  ● Unisex latex fancy dress elf ears.  ● Easily hook the ears over your ears! 1 pair elf ear. Size: Suitable for most ears. Easy to wear. Just clip on your ears. A brilliant pair of Santa elf pointed green vinyl ears! Fantastic for Christmas parties and events. 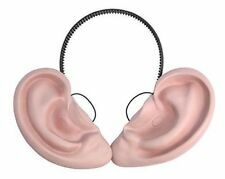 These fantastic pretend ears hook easily on your ears and fit comfortably. Pointed realistic mythical look. 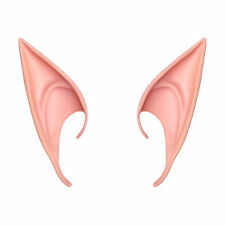 Quality children's Pointed Fancy dress Ears set. All orders are dispatched within 24 hours. I Pair of ogre Ears. Simply fit over your own ears. 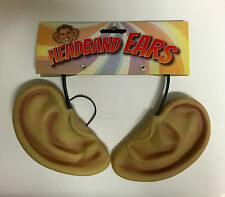 Product fits over the top of your own ears for a realistic look. Lord Of The Rings Elf Ears. Condition is New with tags. Dispatched with Royal Mail 2nd Class. Big Night is all about making your party a big one whether its in or out, make it a Big Night! Any claims or disputes arising out of this contract must be made within an English Court. You are advised to test any face paint / make up / hair products on a small area of skin prior to general application. Giant Ears. 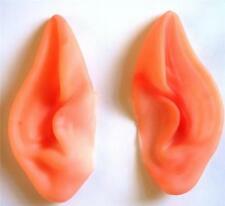 A pair of flesh coloured rubber ears. Soft Vinyl Pointed Elf Ears. We will always strive to solve any issues you may have. 60s, 70s and 80s. The ears are worn on top of your ears for fun fancy dress. A great pair of big ears for instant fancy dress effect. ~ Fun Fancy Dress Accessory. Unisex fancy dress accessory. Suitable for adults or children these giant vinyl flesh coloured ears are the perfect accessory for the BFG fancy dress. They are attached to a black headband and are simple to wear. Just place over ear tip and the Vinyl ears Stay in place as if by magic! Adults ear tips Includes ear tips only Ideal accessory for Alien or elf fancy dress costume Colour: Brown Size: One size . 2 Pairs of Elf Ears. - Material: Plastic, Latex. Just buy it! Don't just think about it! - Easy and comfortable to wear. Perfect for cosplay such as Elves, Fairies, Pixies. Unisex e-l-f ears,fit for most, easy to wear. 1 Pair E-l-f False Ears. Quantity: 1 Pair. Light skin color, You can change the color with make up. Color: Light Skin. 1 Pair of Fairy Pixie Soft Elf Ear Cosplay Accessories Halloween Pointed Ear Was£2.22 x 1 Price:£2.07 x 1. 2 Pairs of Elf Ears. - Easy and comfortable to wear. Comfortable and easy to wear and take off. - Color: Cuticolor. 2 Pairs of Elf Ears. People always bought together with. Includes one pair of elf ears. Type: Artificial Elf Ears. 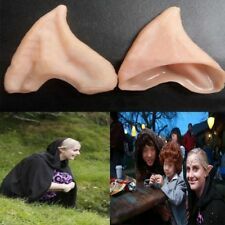 1 Pair of Artificial Elf Ears. Occasions: Halloween, Party, Club, Cosplay, etc. Quantity: 1 Pair. Features: Halloween Prop, Cute, Soft. Fit for: Universal. Size: 4.5cm x 12cm/1.77" x 4.72" (Approx.). 1 pair elf ear. Size: Suitable for most ears. Easy to wear. Just clip on your ears. Color: as picture shown.